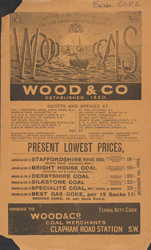 The Industrial Revolution that began in the 18th century increased the demand for coal, and for much of the 19th century all domestic and industrial heating was done by coal fire. Coal could be wasteful, however - as much as 80% of the heat could disappear up the chimney. It was necessary, therefore, to develop grates and systems to keep the heat in the house. Coal was cheap so large quantities were kept in a pit underneath the house. Servants would bring coal up when it was required.